During last night’s Democratic debate, Senator Bernie Sanders said he would not raise tax rates as high as they were in the 1950s. And if Twitter data is accurate, his comment about being “not that much of a socialist compared to [President] Eisenhower” was one of the evening’s most memorable moments. But a clever line is not the same as smart policy. Promising not to raise top tax rates to 90 percent or above is hardly a sign of moderation from the Vermont politician. 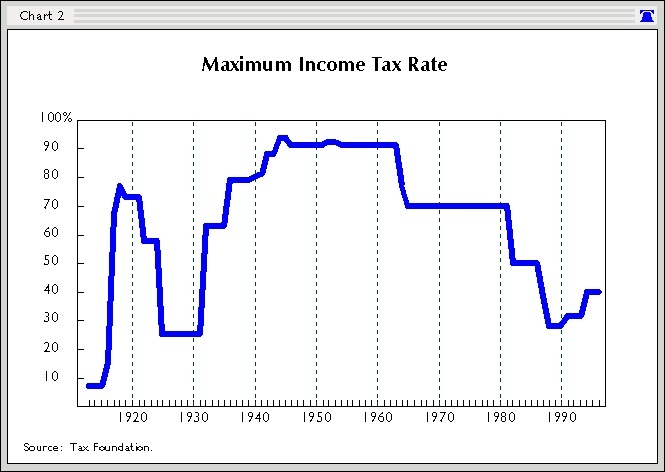 Fortunately, not all Democrats are infatuated with punitive tax rates. Or at least they didn’t used to be. When President John F. Kennedy took office, he understood that the Eisenhower tax rates (in fairness to Ike, he’s merely guilty of not trying to reduce confiscatory tax rates imposed by FDR) were harming the economy and JFK argued for across-the-board tax rate reductions. …an economy hampered by restrictive tax rates will never produce enough revenues to balance our budget just as it will never produce enough jobs or enough profits. Surely the lesson of the last decade is that budget deficits are not caused by wild-eyed spenders but by slow economic growth and periodic recessions and any new recession would break all deficit records. In short, it is a paradoxical truth that tax rates are too high today and tax revenues are too low and the soundest way to raise the revenues in the long run is to cut the rates now. Here’s a video featuring some of President Kennedy’s wisdom on lower tax rates. If that wasn’t enough, here’s another video featuring JFK’s wisdom on taxation. 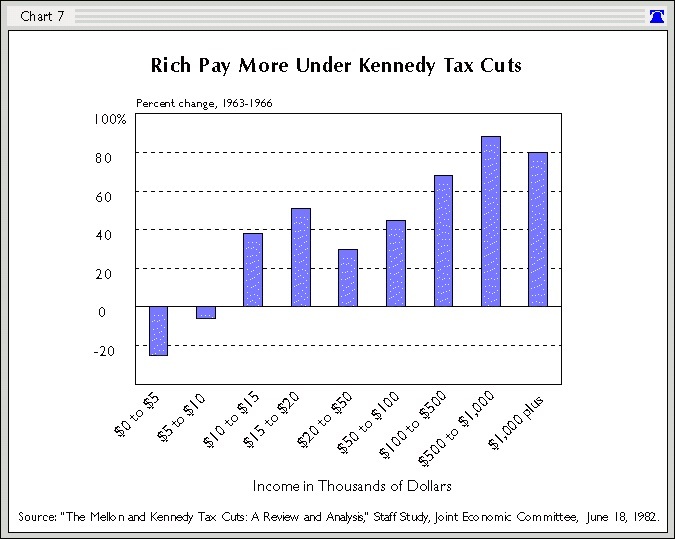 By the way, if Senator Sanders really wants the rich to pay more, one of the lessons reasonable people learned from the Kennedy tax cuts is that upper-income taxpayers respond to lower tax rates by earning and reporting more income. Here’s a chart from a study I wrote almost 20 years ago. Last but not least, let’s preemptively address a likely argument from Senator Sanders. He might be tempted to say that he doesn’t want the 90-percent tax rate of the Eisenhower years, but that he’s perfectly content with the 70-percent top tax rate that existed after the Kennedy tax cuts. But if that’s the case, instead of teaching Sanders a lesson from JFK, then he needs to learn a lesson from Ronald Reagan. People forget JFK was 1st generation inherited wealth, and his father actually made the money – working/investing/criminally?. You can imagine that he grew up hearing more about how wealth is acquired and retained than his children or children’s children ever heard. That had to have some effect on his thinking. Kennedy was wrong though. As we have seen from the past decades, deficits are absolutely created by wild-eyed spenders. When the taxpayers can’t keep up with the tax spenders, and reckless borrowing becomes the norm to cover shortages, then you have ever greater deficits which impair the potential for economic growth. JFK was smart enough to know the tax cut had to be “across the board” to get it through Congress. There is no evidence he wanted to cut taxes for the rich. Tax cuts are effective because they produce economic demand. However, they are most effective when given to the poor and middle class who will the spend the additional money. The rich will always invest, hopefully Rich Americans in America, if they see the chance to make another dollar.